Sometime around 2007, I started photographing my outfits for quick reference on those “I don’t know what to wear” days. I found a few online communities where women would post pictures of and critique each other’s style that I started participating in and eventually started my first “public” fashion blog in 2008. 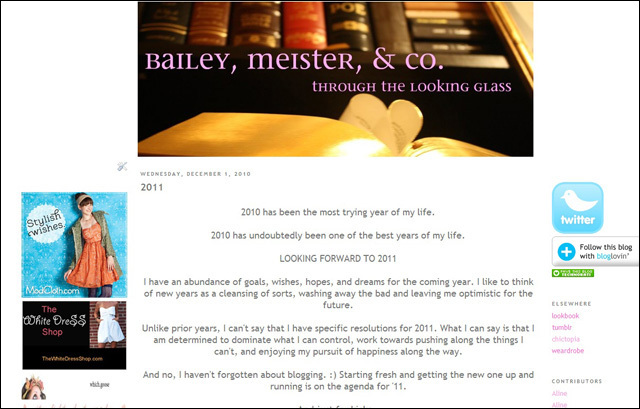 After a month or so, I found that my blog was evolving from fashion and personal style to reflect all of my interests. While I have since retired that blog, I knew that if I were to ever begin the blogging journey again it would have to be a blog that reflects who I am. It was a tough decision to close the doors on something I was so deeply connected to, but I chose to take down Through the Looking Glass last year. I had outgrown it and I wanted to start fresh. Even after I had removed it from public view, it really really really sucked when my domain was attained by some sort of domain squatting spambot. Since Through the Looking Glass, loads have changed. I experienced a really big (and not so great) move. My exercising routine is now at the forefront of priorities. I went from having the two best doggies in the world to one. My culinary and fashion choices have been exposed to so much. I started dating my best friend, the man of my dreams. I’ve shuffled around my close circle of friends, losing few and gaining some. This has also been the same time that my father lost a 4 year battle with cancer. I’ve learned more about myself in the last two years than I have maybe in the last 8. The result of life changes and fluctuations? I am happier than ever. I have my Mark. I have this website (I have yet to give the official thanks to the two responsible for it). I have a revamped eye-catching resume that’s helping me chase my dreams. I have the greatest friends including my bff, and because of her I have Gadchick and The Slow Readers. I have Twitter (if you know me, you know that Twitter is basically my favorite thing ever and has changed my life in wonderful ways). I am ready to come back here. I have missed blogging terribly. I’ve moved on from the things that have pulled me away from blogging, and I’m now focusing on the things that make me, well, just happy (I count 4 so far). Why then, In Case of Fireworks, Break Glass? Well first off, I would never question fireworks, as for the rest of the title, let’s just say I’m ready to break what came before this. I used to only look through the looking glass, it seems. The person I am today is tired of looking, I am ready to live. I couldn’t be happier than I am today. Being able to share this with you is so special to me. Although the blog has launched, version 2.0 coming next year shall bring many social changes! I appreciate you being here and I am so thrilled to have found my way back to this wonderful community that means so much to me. !!! So glad you’re back. 2012 is going to be a great year. Great to see your return! Your happiness shows! Of course, I cried reading this. Welcome back!! yay! and i’m with Cesar – 2012 will be a great great year! Wow Aline! I had no idea this was the same ‘Aline’ from back when I started blogging! Nice that you’re back. You’ve been through a lot, and it’s great that you see the positives. Wishing you all the best in your journey! Well a massive welcome back. It sounds like the last 2 years would have pushed every emotion to the edge, loosing your father and beloved dog just a few of the things which are massive by themselves. I wish you all the inspiration and success for the new start of your blogging. I love the name and explanation too – heres to never looking through the glass again, but breaking through it. What lovely thoughts! I look forward to “getting to know you” more through your blog and Gadchick. Cheers to 2012! Glad I found your new site! Perfect for a new start for a new year. Happy new year Aline! It’s nice to see you blogging again. The new site looks great too.